Hello everyone, welcome. Today I wanted to share some thoughts I had on encounters in roleplaying games. If you have previously read my work you might realise that I am not a huge fan of random encounters and that I don’t tend to plan in advance the route players will take in a game. This has sometimes lead to entire sessions where the players chased red herrings, but so long as fun is had it doesn’t really matter. Today, specifically I am going to talk about planning encounters. Or rather, not planning them. For more of my thoughts on Random Encounters, you can read my Random Encounters post. If you want to understand my thoughts on game plot, then you can read my To Plot or Not post. I tend to favour World of Darkness games and I don’t tend to think of things that happen in those games as encounters so much as it is a scene in a story which is the main reason I never really thought about encounters before. However, my friends and I have all been participating in a game of Starfinder and every few sessions we are rotating the Games Master. It was recently my turn and this post is written as a result of lessons that might seem obvious in hindsight but I will wager there are those out there that didn’t think of it despite it being straightforward (again, in hindsight). The game is happening on a space station that is a cross between Deep Space 9 (from Deep Space 9) and Mos Eisely (from Star Wars). The game is adventure-centric and I wanted to advance a plot whilst also appealing to the adventure-centric nature of the game. And by Adventure-Centric, I mean a game where players are looking for the quest giver so they can go to the kobold mine and kill all the intruders, get loot and get rewards. So I took one of my favourite kind of Deep Space 9 plots, the Station-wide Disaster and used that as a starting point. Players were woken up in the middle of the night by Station Disaster alarms, and had to defend the inn/tavern/rip off Quark’s Bar from a local Mob. This was a fairly standard combat encounter. However, it was intended as a setup for the next encounter and that is what I want to talk about. The bar owner tasked the players with hunting down the Bugfather, the leader of the attacking mob. Bugfather – because they were all from the insectoid Shirren Race. The players learned the location of the Bugfather’s lair, a restaurant and were told to deliver a “Message”. A standard encounter like this would probably be set up as a Gauntlet of Mooks for the players to plow through, however I decided on something different. I defined the layout of the interior in general terms, and also that there were a fair number of Shirren Gangsters in the restaurant and outside. As part of the plot, players learned that when power outages affected the station, as they were now, that gangs settled scores whilst security was busy. So, I defined that there were visible guards outside and noted that there Could be a lot of reinforcements inside. I then just created a basic statline and left everything else blank. I didn’t prepare a map, or named NPCs, just left the interior as a void in my notes. Schroedinger’s Encounter. It could be ambush. It might no be. No one knows until you peek inside the box. So that is all well and good, I can decide ad hoc to ambush the players if they were having an easy time of it, but that wasn’t the main reason I wanted to share my thoughts here. Because I had written nothing about the inside, it meant that if the players came up with a good idea, or a bit of backstory (or if they had a contact or something like that) and they tried to use it, I wasn’t locked into anything and could adapt to the game they wanted. There were 3 trigger happy players and a medic. The medic decided he might be able to parlay his skills into getting beyond the front door. He voiced that intent and immediately I populated the inside with the Bugfather, his top enforcers and his wounded Son – wounded whilst out settling a score. This gave a player who was less combatant, and who hadn’t had much opportunity to use his medic skills an opportunity to shine. He was able to talk his way past the guards and was ultimately drafted to patch up future Bugfather (plot hook for later…), with the threat the gangsters will kill him if he failed. Which he very nearly did, as a result of poor rolls. Fortunately he pulled it back. So, how can this be applied? If an encounter doesn’t need to be set up in a specific way, then don’t set it up. It gives you flexibility. If the players have skills that they could conceivably use to overcome the encounter, put something reasonable in there that they can affect. In the case of a gangster hideout on a night of reprisals, a wounded son of a crime family was perfectly legitimate. In truth, I had made the gang Shirren because there is a Shirren player, and it was so he could try and fit in/infiltrate/whatever but he was unable to attend, so I adapted. The key here is that if you don’t define the encounter fully, make sure what you come up with is believable in the circumstances and that it ties to the characters (or a character) specifically. It gives them a reason to engage with the game in other ways besides shooting their way through everything which I find gets dull pretty fast. And if you are worried that you might not be able to ad hoc it the first time, you can always have a gauntlet of mooks ready as a plan b. 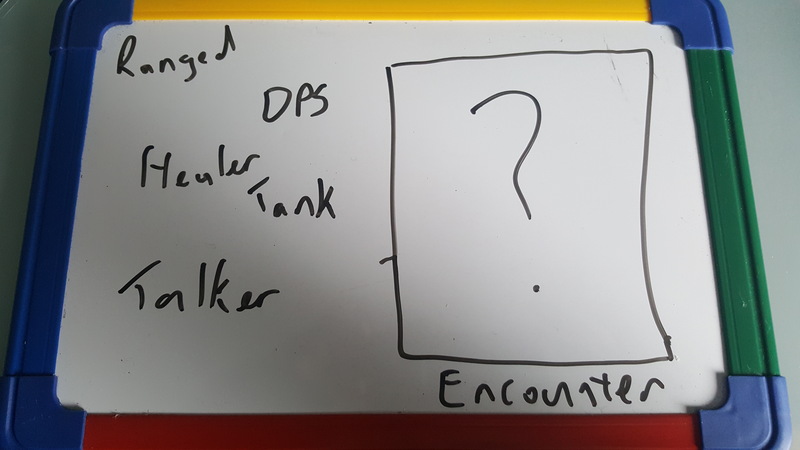 So, tell me what are your thoughts on encounters? Do you do this? If not, does it make sense?